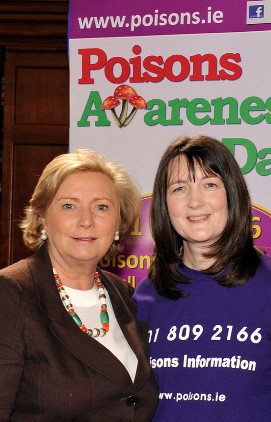 The first Irish Poisons Awareness Day was held on Friday 20th April. The focus of the day was the prevention of accidental poisoning in preschool children. To mark the day, the National Poisons Information Centre produced a “Say No to Poisons!” storybook in collaboration with Early Childhood Ireland (ECI) and the HSE. The book aims to teach young children to always ask if something is safe to eat or drink. The Minister for Children and Youth Affairs, Ms Frances Fitzgerald, officially launched the book at the ECI conference on 20th April. All 250 delegates at the conference received a copy of the book and related teaching materials, and the book will be distributed to preschools around the country. Thank you to everyone who visited our Poisons Awareness Day stand here in Beaumont Hospital on 20th April. We also distributed information on preventing accidental poisoning to St Raphael’s Ward, Our Lady’s Hospital Crumlin, Children’s University Hospital, Temple Street, and the National Childrens Hospital, Tallaght. Pictured at the launch: Minister for Children and Youth Affairs, Ms Frances Fitzgerald, with Nicola Cassidy, Poisons Information Officer and author of the "Say No to Poisons!" storybook.